Somalia is ranked 167 out of 168 for corruption. It's score is 8 of a possible 100. Corruption and Anti-Corruption in Somalia. Corruption is rampant in Somalia. A 2013 UN Monitoring Group report on Somalia and Eritrea indicated that 80 percent of withdrawals from Somalia’s central bank were made for private purposes. In 2014, the monitoring group alleged that the president and a former foreign minister conspired with U.S.-based law firm Shulman Rogers to steal funds from overseas Somali assets. 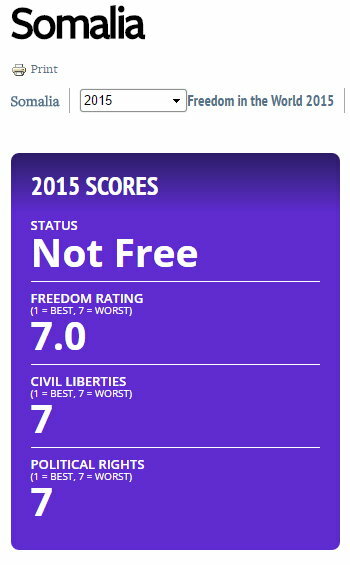 Source: Freedom House review of Freedom in Somalia. Al-Shabaab upped terrorist attacks and recaptured locations across south-central Somalia: attacked and recaptured several towns in Lower Shabelle, Bay and Jubaland regions, including 8 Feb temporary occupation of Marka and 16 Feb attack on Afgoye, locations lost by Al-Shabaab in 2012. Local clan militia, AMISOM and Somali National Army regained control of some towns from Al-Shabaab in Middle Shabelle during month. Kenya govt claimed its 8 Feb airstrike killed Al-Shabaab Intelligence Chief Mohammed Karatey, denied by Al-Shabaab 18 Feb. Al-Shabaab 26 Feb launched complex attack involving gunmen accompanying vehicle-borne explosives on Mogadishu hotel popular with govt officials and MPs opposite presidency killing at least 30; Al-Shabaab suicide bomber and car bomb 28 Feb hit two locations in Baidoa, Bay region, killing at least 30; suicide bomber 2 Feb detonated on board passenger plane, only bomber killed. AMISOM troop contributing countries 28 Feb held summit in Djibouti to reinforce military operations against Al-Shabaab after months of setbacks. Two killed 1 Feb in anti-govt protest in Puntland’s Bari region; police same day raided home of Bari governor Gallan on suspicion of instigating protest. Corruption is rampant in Somalia. 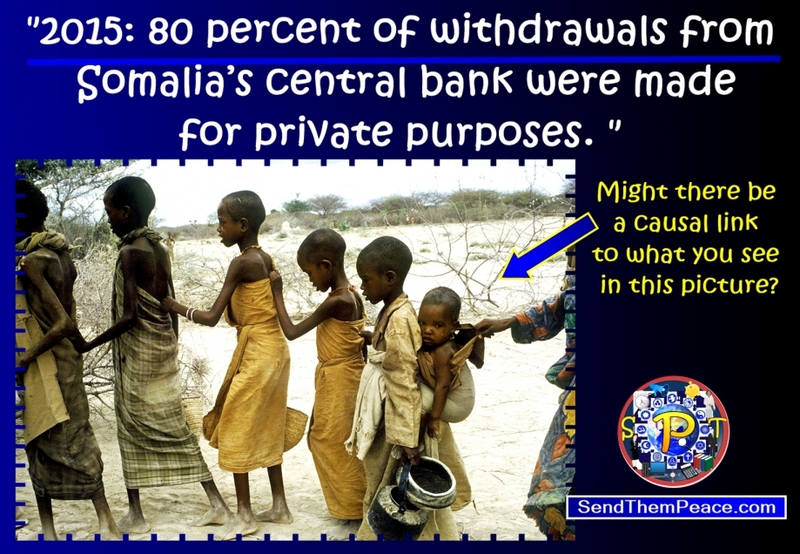 A 2013 UN Monitoring Group report on Somalia and Eritrea indicated that 80 percent of withdrawals from Somalia’s central bank were made for private purposes. In 2014, the monitoring group alleged that the president and a former foreign minister conspired with U.S.-based law firm Shulman Rogers to steal funds from overseas Somali assets. DON'T Send Money: They'll never get it! SendThemPeace! Meet The Challenge.